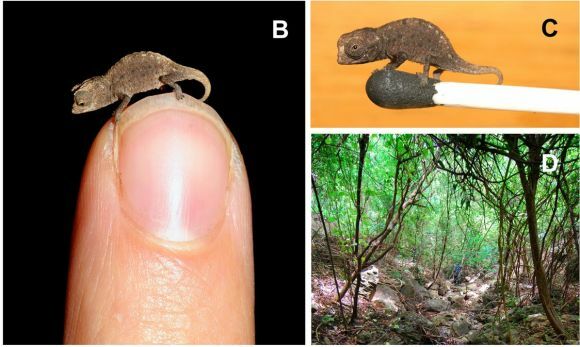 Scientists have discovered a new species of chameleon, Brookesia micra, believed to be the smallest in the world. Brookesia micra chameleons live in the remote forests of Madagascar. The juveniles are small enough to fit on the head of a match. The tiny lizard, native to Madagascar, measures less than 30 millimeters fully grown – and when young, it is small enough to stand comfortably on the head of a match. It was found by a team of German and American scientists, who described their discovery in the PLoS ONE journal. The miniature chameleon lives on the forest floor by day and crawls into low branches to sleep at night, they say, which is when the researchers spotted it. Dr Frank Glaw of the Bavarian State Collection of Zoology, who led the expedition, told the BBC he and his colleagues scoured the forest at nightime during the wet season, using torches and headlamps to spot the rare lizards as they roosted. They were seen only in one remote islet in Madagascar's uninhabited Nosy Hara archipelago, which the scientists suggest provide the explanation for their small size. In a phenomenon known as island dwarfism, species confined to islands commonly evolve into minature versions of their mainland cousins, according to Wired, possibly due to limited resources and pressure to reproduce faster. The specifity of their habitat also means that the species is extremely vulnerable to extinction if the forests it lives in are threatened, Glaw warns. Brookesia micra is one of four new species of chameleon they documented on their expedition to Madagascar, which according to The Local is home to nearly half of the world's 193 known species of the reptile. The country is known for its many rare species of giants – including giant lemurs and tortoises – as well as dwarfs, such as the world's smallest primate, the mouse lemur, and some of the tiniest known frogs. Brookesia micra, too, shares the island with the world's largest chameleons, which can grow to almost 70 centimeters long.